The most commonly used PABA derivative is Padimate O (OD-PABA). It is less likely to cause hypersensitivity reactions or stain clothing, but is still able to filter UVB radiation efficiently. Padimate O may also disrupt endocrine activity. Endocrine Disruption: Studies performed on rats and on thyroid tissue samples suggest that PABA may disrupt thyroid activity.,,In a study conducted on thyroid tissue samples, researchers found that PABA inhibited thyroxine, the primary hormone secreted by the thyroid gland that regulates metabolism. Decreased levels of thyroxine may lead to hypothyroidism which includes symptoms such as fatigue, weight gain, and muscle weakness. The PABA derivative Padimate O appears to be weakly anti-estrogenic (meaning it suppresses estrogen pathways). Another PABA derivative, Et-PABA, disrupts estrogenic and androgenic activity. Sensitization: UV radiation is more likely to damage DNA in the presence of PABA, and DNA damage to the skin increases the risk of skin cancer.,, These studies raise serious concerns about the potential for PABA to sensitize skin to radiation although human studies are needed to confirm these findings. In the absence of such studies, precaution may be warranted. Bioaccumulation: Padimate O dissolves in fats (it is lipophilic) which is a common feature of chemicals that bioaccumulate in the environment and the food chain. Not surprisingly, Padimate O appears to accumulate in fish. REGULATIONS: Banned or found unsafe in both Canada and the European Union. The US FDA regulates PABA use at a maximum of 15% concentration, while Padimate O is regulated at a maximum of 8% concentration. HOW TO AVOID: Read labels and avoid sunscreen products that contain PABA, Padimate O and other PABA derivatives. NDM Hodges, SH Moss, and DJG Davies. “The sensitizing effect of a sunscreening agent, p-aminobenzoic acid, on near UV induced damage in a repair deficient strain of Escherichia coli.” Photochem Photobiol. 1977 Nov;26(5):493-8. Print. Shaw AA, Wainschel LA, and Shetlar MD. “Photoaddition of p-aminobenzoic acid to thymine and thymidine.” Photochem Photobiol. 1992 May;55(5):657-63. Print. Morohoshi K, Yamamoto H, Kamata R, Shiraishi F, Koda T, and Morita M. “Estrogenic activity of 37 components of commercial sunscreen lotions evaluated by in vitro assays.” Toxicol In Vitro. 2005 Jun;19(4):457-69. Print. Mulliken JS, Russak JE, and Rigel DS. “The effect of sunscreen on melanoma risk.” Dermatol Clin. 2012 Jul;30(3):369-76. Print. Kunz PY and Fent K. “Multiple hormonal activities of UV filters and comparison of in vivo and in vitro estrogenic activity of ethyl-4-aminobenzoate in fish.” Aquat Toxicol. 2006 Oct 12;79(4):305-24. Print. Hodges ND, Moss SH, and Davies DJ. “The sensitizing effect of a sunscreening agent, p-aminobenzoic acid on near UV induced damage in a repair deficient strain of Escherichia coli.” Photochem Photobiol. 1977 Nov;26(5):493-8. Print. Hodges ND, Moss SH, and Davies DJ. “Elucidation of the nature of genetic damage formed in the presence of the sunscreening agent, para-amino benzoic acid, during irradiation with near ultraviolet light.” J Pharm Pharmacol. 1977 Dec;29 Suppl:72P. Print. Osgood PJ, Moss SH, and Davies DJ. “The sensitization of near-ultra violet radiation killing of mammalian cells by the sunscreen agent para-aminobenzoic acid.” J Invest Dermatol. 1982 Dec;79(6):354-7. Print. Gago-Ferrero P, Diaz-Cruz MS, and Barceló D. “UV filters bioaccumulation in fish from Iberian river basins.” Sci Total Environ. 2015 Jun 15;518-519:518-25. Print. Hexsel CL, Bangert SD, Herbert AA, and Lim HW. 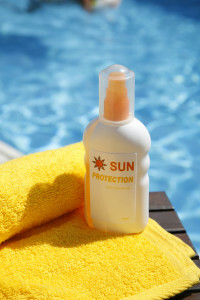 “Current sunscreen issues: 2007 Food and Drug Administration sunscreen labelling recommendations and combination sunscreen-insect repellent products.” J Am Acad Dermatol. 2008 Aug;59(2):316-23. Print.